All I Want for Christmas is The Carolina Dog Ladder! Hi! It’s Cooper! I am putting this at the top of my Christmas list! I love my time on the coast, and this ladder makes is so easy for me to get out of the water so I can jump right back in again! And I feel safe! No more crawling to the dock and being a little scared I won’t make it! It was no problem for me to figure out, and this great idea makes playing in the water more fun for everyone! Check out this great story below, and I say support a business entrepreneur! The edges of the eastern and southern U.S., along with thousands of lakes, rivers and ponds dotting the interior, play host to tens of thousands of docks. Great playgrounds for dogs of all types, but especially sporting dogs and their masters who love a good retriever training session or just a fun game of leap, swim ‘n fetch. 20 years ago on Edisto Island, SC my Dad and I were enjoying such an afternoon with his labrador Jessie. 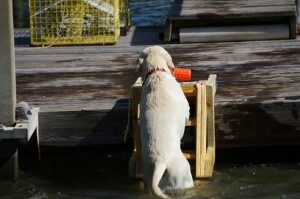 The challenge of his Milton Creek dock, along with just about any other dock, was that Jessie had no way to swim back onto the dock with her retrieved toy. She had to swim back in through the marsh grass, pluff mud and oyster shells, and then make her way back down the walkway to the dock to complete her retrieve. Dogs have been known to drown attempting to “crawl” their way up onto a dock. 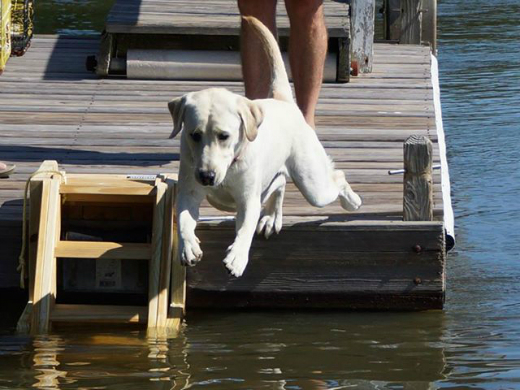 Their hind legs have nothing to step onto, and many will sink quickly if their front paws slip from whatever they’ve managed to grab on the dock. That evening we sketched out the concept for the Carolina Dog Ladder on the back of a paper plate. 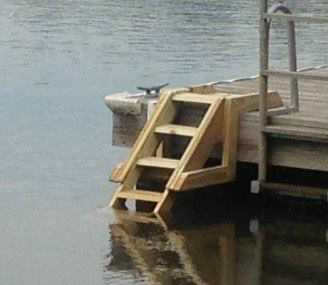 Within a few days Dad had brought our engineering creativity to life, and our first dog ladder was affixed to his dock. He had explained it all to Jessie as it was built and attached to the dock, and according to his tale, she knew precisely what it was for and swam right up on it with the next floating tennis ball toss. As soon as each of his neighbors saw it, they were offering Clemson-Carolina ballgame tickets, bushels of oysters… anything in exchange for one to adorn their docks. Several dozen still remain affixed to old Edisto docks, along with friends’ docks in Florida, Georgia and Alabama. Dad has seen many a “thanks Old Man” glance from more than a few wet dogs. Flash forward to 2013, and after hearing, “…y’all need to sell those things” more than I could bear, I’ve put some energy into building a brand and small business out of The Carolina Dog Ladder. Yes, since 1993 a few others have designed various ramps and contraptions allowing dogs to swim up to boats or docks, but none are as functional, sturdy or unique as ours. The Carolina Dog Ladder is made locally (in our South Carolina workshop) from local pressure-treated pine, and can be shipped nationally. For us, it’s more about the lifestyle of floating docks, rising and falling tides and dogs that love to get wet. Yes, the Carolina Dog Ladder makes swimming from a dock safer for a dog, more convenient for masters, and has clever features like a sliding ladder that pins into place up out of the water when not in use. But it’s really about happy dogs, proud of their swimming skills and enjoying the water with their best friends.